Belles On Bikes is an all-women supportive cycling group that has been pedalling for a few years now. Our aim is to encourage new cyclists to become intermediates, to get fitter and join in our longer rides. We push off on Sundays at 10am from the entrance to Palmer Park Stadium. We are very lucky to be able to borrow bikes and helmets from the stadium, something which has been a great success in helping women ‘give it a go’. Throughout the summer we are running Saturday morning beginners’ skills sessions, to take advantage of the good weather and people’s willingness to get on two wheels. We use ‘Meet Up’ to post ride updates: www.meetup.com/Belles-on-Bikes – so why not register and come along! Women are welcome to join this 8-day trip cycling across Lebanon, from 30 September to 8 October 2017. 250 women from 20 countries will be participating, meeting local people and visiting refugee camps. ‘Follow The Women’ is an international women’s peace organisation whose core purpose is to empower and inspire women to become key actors in cross-cultural understanding, peace building and to support human rights for all. Bring women from all over the world together to experience the reality of the Middle East. Cycle together in the name of peace. Build bridges between women from diverse cultures and beliefs in order to enhance knowledge, education and understanding. Foster the sense of unity and develop long-lasting networks that will make a real difference to the peace process. 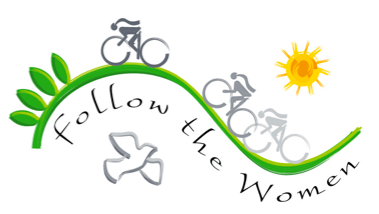 Promote the bicycle as a vehicle of peace and empowerment. Identify, develop and fund tangible projects that will make a difference. By building bridges, not walls, women are empowered to promote peace, reconciliation, love, security and stability on the critical journey to global peace and a safer world. Accommodation will be basic and cost £250 for the week. Flights currently are roughly £325. You will be provided with a new mountain bike, T-shirts and a promotional bag. We will be accompanied by security on cycles for the duration of our trip. If you want to find out more, visit our website www.followthewomen.com or email Reading Cycle Campaign member Summreen Sheikh at sheisum78@hotmail.com for details.